Inspired by this 2014 post from @spanishplans March Madness with Music, I decided that this year I would give it a try! I searched through top 40 hits on Latino radio and I found 16 songs that I thought the class would like… but this didn’t leave room for any of our class favorites. It was tough because I knew a new song would have no chance against a song the class was familiar with!! In the end I selected 8 of our class favorites to add to the competition. Our business teacher has a program that makes brackets and a poster printer so he set me up! We gave the 16 new songs pairings in the first round and all 8 familiar songs had a bye. Each day, students got a ballot with a space to write each song name and a space to vote for the favorite. Their votes were based on a score. They ranked the melody, rhythm, tempo, and instruments between 1 (low) and 5 (high). The song with the highest score was the “favorite” and the song with the most votes at the end of the day advanced. 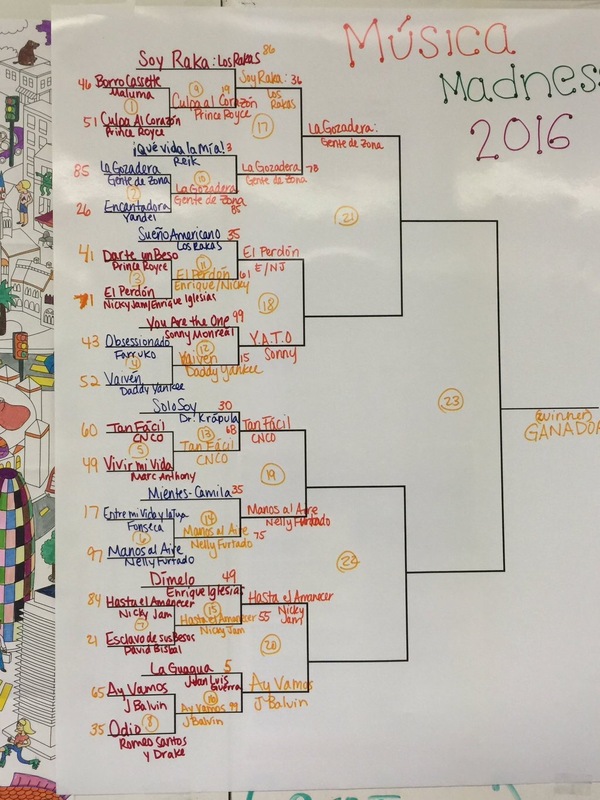 Round 2 (byes vs round one winners) held a few upsets. My favorite song, Solo Soy by Dr. Krápula lost by more than 50 votes! We are in round 3, the quarter finals right now. I was SHOCKED that la Gozadera (which I love) beat Soy Raka by los Rakas, a class cult classic! Yesterday Sonny Monreal’s You are the One (the first song we do in Spanish 1 and everyone’s first love) got knocked out by Enrique Iglesias/Nicky Jam’s El Perdón. It was tied at the end of the day and my class said I couldn’t break the tie with my vote because everyone would get mad at me… so we brought in Cory the janitor and he watched the videos and chose! 🙂 I would have voted for El Perdón anyway but I was glad I had him to blame when the Sonny groupies were mad. In round 1, we watched the whole video (where appropriate, when it wasn’t appropriate we watched a lyric video). In round 2 about 2 minutes of the song/video. In round 3 we are only watching about 1 minute of each because they have downloaded them all already! A fun side effect has been that they’re downloading THESE songs but also downloading other songs by the new artists. It is such a small investment of class time to get them all kinds of Spanish listening at home! Those lyric videos… they just made them want to go home and watch the real thing! 🙂 So many minutes of Spanish! Try this next year! We have bonded over the ups and downs of these battles! Thanks @spanishplans for the inspiration! Sounds like a great time! I think I’ll have to try this next year! Did you do this in every level or in one particular level? My kids love this tournament! We finished over a month ago and my students are still singing the songs to themselves in class and requesting their favorites! I play songs all the time, but with this “tournament” that they get to vote on, they get so much more invested in the songs. Added images to the post! Borro Cassette and some of the other first 16 are explicit so if you have heritage speakers they might need to be replaced! I love this! I think this will be something we can do next year. Or maybe May madness would work….. 🙂 Quick question? Did you have each class vote and then tally or did you have only one class you did this with? Thanks again for the great ideas! I love this activity!! Thanks for sharing your favorites- I’m always looking for new songs to share with my class. One idea to make your Music Madness a bit easier for bookkeeping (if you are a 1 to 1 school with computers for all students) is by putting the votes on a google form. By doing this, google will do all the tabulation for you AND added bonus, you can attach the videos of your songs to the form so students who might not look the songs up on their own have it at their fingertips- staring them in the face begging them for one more listen! This was a big hit in my class as well and my class was so sad when it ended. 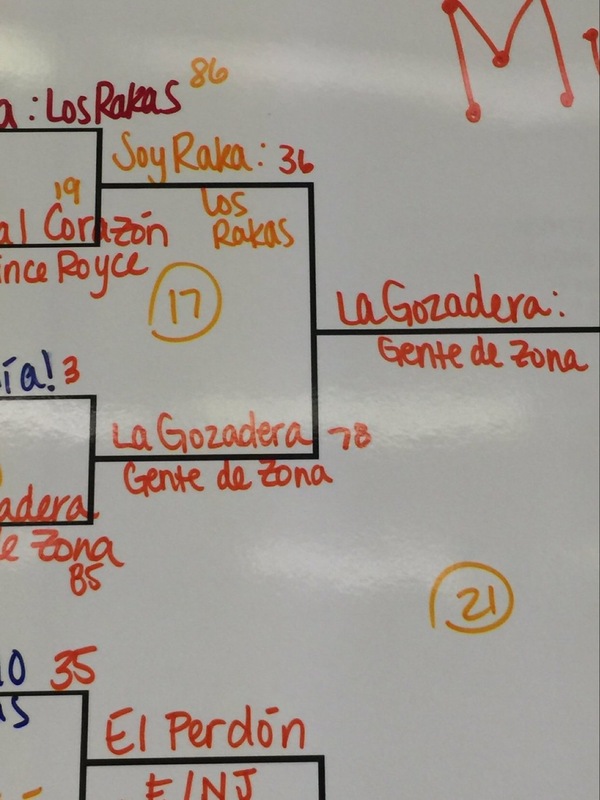 La Gozadera is our reigning champion! I’ll be excited to hear who wins for you! I have a few logistics questions for you. Can I email you directly? The ballot only had space for the one song (of the two) that they chose for the day, correct? The songs that were “favorites” were the ones that advanced? I got a little confused there. The first day I copied the ballot front and back. They listened to them and voted on both (one on each side).it was a huge waste of paper so the next day I squeezed 6 ballots on each side (landscape and 2 column) so they could vote for 6 days worth of songs on one page! The favorites (most votes not highest score) advanced! Thank you for both responses!! Can’t wait!! !